Is a Pet a Good Idea For Your Family? Anytime my three year old sees a dog she either asks if she can have that one, or if we can get another dog to live with us. 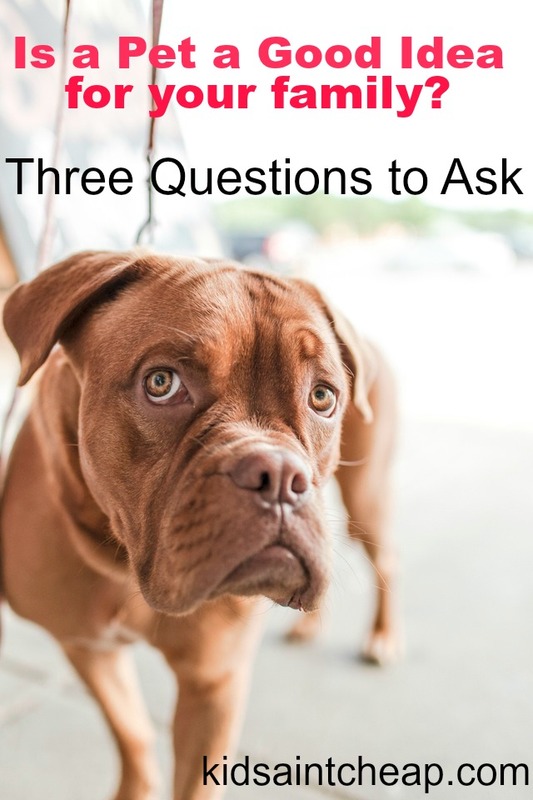 As a fellow animal lover, she comes by wanting it honestly but we simply cannot have a dog for a number of different reasons but this doesn’t stop her from asking. A pet is a huge responsibility, especially a dog. One of the big reasons I wouldn’t bring a dog into our lives right now is because we have an incredibly stressed out cat who suffers from IBS and I’m sure the stress of any other animal in the house would be enough to set off her IBS bad enough that it kills her. It would be totally unfair for us to do that to her. I’ve always had pets growing up, cats, fish, hamsters, birds and dogs. We were big into animals but now that I’m a homeowner, mother and pet caretaker I have a totally different perspective on animals and the responsibility that comes with it. We can’t even go away overnight without having our cat looked after since she’s on such a strict feeding schedule. So many families take on the responsibility of a pet without thinking it through and it doesn’t always end well. 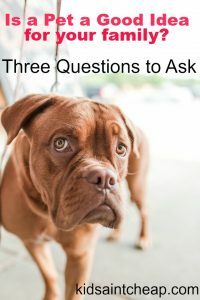 There are a few things that need to be considered before you bring any pet into the picture, regardless of your family situation. Pets are expensive. To properly care for an animal they, at the very least, need regular food and exams. Expect extras too, in our case it’s expensive prescription cat food and multiple vet visits per year. All of these expenses need to fit into our budget. The cost of owning a pet goes beyond simply paying the pet store or adoption agency the initial fee. Does it work for your family lifestyle? Even before we had kids a pet like a dog wouldn’t work for us. We’re not home enough and for an animal like a dog, which needs to be let out regularly and walked, we simply can’t do it. We also like to travel, even just to see family for a weekend, and a dog wouldn’t work. Consider your day-to-day schedule and see how owning a pet wold impact it. If you can’t make it work fairly for both you and animal it’s not a good time. Another huge reason we won’t have a dog anytime soon is because my husband doesn’t have much interest in caring for one. He’s being fair and honest. I would hate for him to push me to have one leading me on to believe he’d help when I know it’s not something he’s interested in right now. With busy careers and a toddler running around I don’t want to be stuck doing everything myself which is precisely how it will be. For years my mom wouldn’t allow my sister to get a hamster because she knew very well she wouldn’t do stuff like clean it’s cage so until she proved herself she didn’t get one. Pets take up more time and energy than I think most families realize. While I totally sympathize with wanting all things cute and fuzzy, unless you’re prepared to care for the pet on all fronts it may not be the best plan for your family. It can just lead to unnecessary stress. Growing up, activity was second nature to me. I’d wake up, go outside and play until the sun went down and repeat the next day. I was involved in some organized sports, but for the most part, unless it was pouring rain there was an expectation on me to be active. The level of inactivity in today’s general population, especially children is alarming. I live on a street full of children and I can count on one hand the amount of times I have seen them actually playing outside. While this doesn’t necessarily mean they’re not involved in organized activity outside of the home, it still concerns me. Unless it is pouring rain, I make sure my daughter gets outside and explores everyday. I want activity to be ingrained in her little brain. A friend of mine recently started complaining about how her overweight son (who is 11) was never going to lose weight because she couldn’t afford to enroll him in an organized sport. Overweight herself, she claims to be determined to not have him lead the life she has as an overweight adult. When I told her I thought ”not being able to afford organized sport” was a poor excuse, she was taken aback. And don’t even get me started on a junk food tax. Though organized sports and activity hold many benefits in many aspects, they are not the only ways to get active and fit. 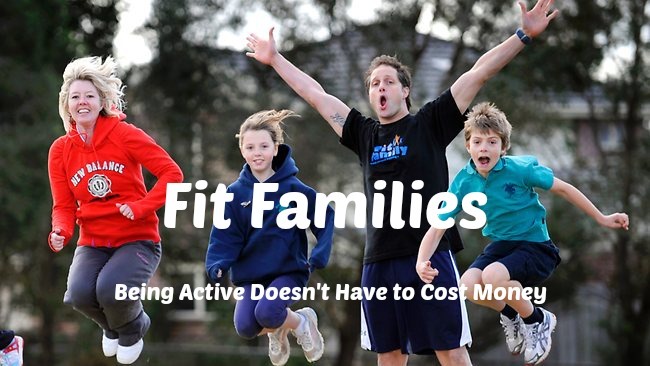 Families who are active together are generally much happier as a whole and individual parts. I can tell you I always feel much better mentally and physically when my whole family gets out together rather than being alone or even me and the little one. Having my husband present is encouraging and fun. Activity is an amazing bonding time for everyone. Playing in the snow, snowshoes, skiing, building snowmen are always fun. Play on the beach, running in the sand, building sand castles. Play electronic games. Electronic games (Wii, xBox, Playstation) can be fun when played as a family, there are many games that encourage activity. Run, there are many family friendly races that you could train and run together. When activity is a component of your life, you feel better in all aspects of your life. You have more focus and are generally more organized and in a better mood. Nothing bad ever comes from being active together. Being active as a family means you are setting your children up for a healthier life than leading an inactive childhood. When children see their parents active they are also more apt to partake in activity. 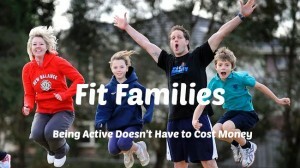 Being fit a fit family doesn’t have to include fancy gym memberships or organized sports. There’s nothing stopping you from exploring the world around you and having fun while doing it! Do you consider yourself to be active? How about your family? Doesn’t a story like this just warm your heart? Do you know of any other examples like this? Smart spending is a practical approach to handling the family’s finances. It is also a great practice to pass on to your children. Some things you can do to raise a family on a budget really boils down to a lot of practicality and common sense. For me, it is all about knowing what the important things are- the things you need, the things you want, and the things you can live without. First, it would be good idea to look at where you are living or where you want to live. Live in a house you can afford. Ok, it might not be the house of your dreams just yet but you will be able to reroute the money to other items that are more important at the moment. 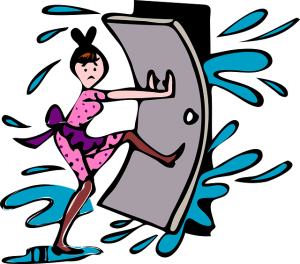 I live in a small townhouse with reasonable rent and it is not the house I want to stay in forever but it is more than enough for my two kids. They feel safe, happy, and comfortable here and that is great. Make sure to limit wastage of any kind. I really try to live by this. Switch off lights when not needed and limit the use of electricals when you can. I live in a tropical country so it is often important to have an air conditioner at home. The use is timed though, very strictly. And during cooler months like now, we use the ac to cool the room rather then use a ventilator. This really cuts down the electricity bill. Do you need that car? If you own two cars, consider having just one. If you are going to purchase a car, do this on a cash basis so you don’t have installment payments with interest to look after in the coming months. You may have to buy a second hand car but this will be good enough to get you to where you need to go. I do without a car at all. I use public transportation and I find that this is saving me money even if it is harder. I plan to get a car but only when I can afford its maintenance and gas prices. Start every year with a budget. I’ve blogged about this ad nauseum but I really think budgeting is essential. Be sure to include occasions like birthdays and Christmas, where you are sure to spend a bit of money. But when these occasions come, stay within your budgeted amount. 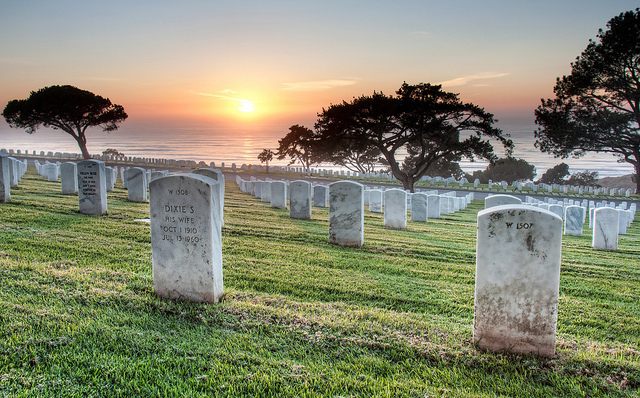 Remember, it isn’t the cost but the thought that counts. You should also set priorities with your budget, such as funding a college or a custodial account for your kids, and saving for your own retirement. This is an important lesson your kids will learn as well. Live on cash. I really advocate this. We do not need to focus too much on credit here, unlike in other countries, so this is really easy to do. But, if you must use your credit cards, pay them all off every month. 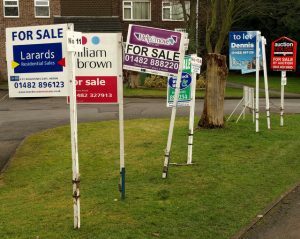 If you only have your house to pay off, you will have a much easier time. Finally, forgo repeated extra expenses like outings and meals outside. Include these in your budget but remember that you don’t always have to spend to have a good time. A home-cooked meal and a rented DVD, a treasured story book from the library, other good books and toys from garage sales, an afternoon picnic in the park are all things and activities that cost very little money but make for wonderful teaching moments and warm memories with the kids. Plus, think of all the money you can save for a college fund! My kids enjoy watching Barney on YouTube in my room as the movie of the night. They also enjoy simple sheets of stickers and pieces of candy as great prizes. Raising kids to like simple things helps make a budget work as well. Now, raising a family on a budget isn’t easy. It is often very hard to resist buying that thing you have been eyeing but not really needing or giving in to the times and getting a computer game or something similar for the kids. But resisting has made a tight budget work for a small family. We are better than ok. When you see how well your kids are learning about the value of resources and how happy they will be with what you are providing, you will feel satisfaction unlike anything else ever. I hope to increase my earnings to have a bigger budget, of course, but I am so grateful that I can provide what I am providing now. It’s something to feel proud about, in my opinion. How do you save money to raise your family? Christmas is my personal favorite time of the year. And there is nothing like a Filipino Christmas. Let me try to illustrate what the season is like here in the Philippines. The Philippines has the longest Christmas celebration in the world. As soon as September hits (known here as the start of the ‘ber months’), you can already smell the season of giving. 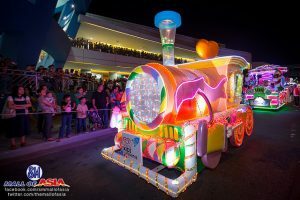 Philippine fiestas are legendary. This no-holds barred party is a reason for the poor man to celebrate, eat, drink, and be merry, all wrapped up together with song and religion. Filipinos LOVE TO EAT. Ask anyone who has visited the country and they will tell you that a staple in any Filipinos welcome package is a large meal. Many large meals. Filipinos LOVE TO SING! Think Charice, Lea Salonga, Jamie Rivera, Monique Wilson, Billy Crawford, among some of the artists who have gone on to world fame. You will find a sing-along machine (karaoke) around every corner. Seriously. Filipinos have always been family-centered- a big factor in the strong yet gentle, kind, giving, and hospitable nature the Filipino is known for. Case in point, Manny Pacquiao. These are all facts you need to know to understand what a Filipino Christmas is like. Philippine history is peppered with influence from Spain and the United States. After 300 years of Spanish colonization, Christianity was firmly rooted in Philippine soil mixing with an already strong belief in a higher being. The 50 or so years of American rule in the 19th-20th century left lasting imprints that are clear in our language, style of dress, educational system, and some traditional symbols. You will definitely see a mix of the Western and the traditional in the Philippines. You will see Christmas trees, of varying heights and color. Yes, color. I don’t know about the US but in Manila we have pink trees, blue trees, white trees, silver tress, and the typical green tree. This will decorated with lights and ornaments as is the Western tradition and is topped alternatively with a lit star or an angel. In addition to the Christmas tree, we have beautiful lit lanterns known as ‘parols’. These are typically made of capiz shell, white or of varying color, with lights inside. A parol of some size and design is usually found hanging outside the house. This lantern symbolizes the star the three kings followed to the barn where the baby Jesus was born. So, in addition to the Christmas tree and the lantern, you will often see a nativity, or statues of Mary, Joseph, and the baby Jesus, as home decor as well during Christmas. You will start seeing bazaar after bazzar spring up in village club houses and church halls starting in October and these bazaars will showcase any kind of gift under the sun from the native item to food to clothes, etc. All at slashed prices making it impossible for anyone to stick to a reasonable budget. No where else will you see a financally struggling populace spend with abandon as some Filipinos do during Christmas. There is a reason for this spending though. In the Philippines we also have the adopted Santa Claus. So parents save months in advance to be both Santa and mom and dad. Frenzied shopping with a purpose is perhaps an apt way to describe the buying of the season. There really is nothing like seeing the joy on your child’s face upon waking up to find Santa visited and was generous. I know this for a fact. Christmas in the Philippines will showcase some of the country’s best native food. There is the roast pig (lechon), sweet meat loaf (embotido), smoked ham, fruit salad, quezo de bola (a round, aged cheese) and delicacies like puto bumbong. This purple colored dessert is made of sweet rice cooked in a hollow bamboo tube. Once cooked they are removed from the bamboo tube and served with spread butter, sugar, and coconut. This dessert, and most of the dishes I mentioned, are only served during Christmas making them eagerly anticipated and all the more special. Of course, food always goes with song in the Philippines and starting the end of November calendars are filled with party after party, all of which have some form of singing to live bands, sing alongs, and Christmas caroling. And again there is the religious aspect. Starting December 16 there is a 9 day novena which most people attend. A novena is a Roman Catholic period of prayer lasting 9 days. So a person attends 9 consecutive masses, praying for a special intention at the same time. The novelty of this novena is that the masses are said in the wee hours of the morning, from 4 am to 6 am. You will see flocks of people, young adults, working folks, etc all attending mass in the early morning. This mass is capped off by an early morning breakfast of hot chocolate, coffee, and Philippine native delicacies. A main mass is celebrated on Christmas day to mark the birth of Jesus Christ. Have I mentioned how Christianity is firmly rooted in the Philippines? All the decoration, masses, gift buying, eating, drinking, and signing are geared towards one thing- being with the family at this special time of the year. Yes, the birth of Jesus is the reason for the season but it is also the one and only time that family is expected to set aside all things, all worries, all animosity just to be together. No other occasion or holiday matches Christmas in that objective. So if you are visiting the Philippines during the season, you will not miss a celebration that has some relation to family. Perhaps Christmas in the Philippines is no different from Christmas anywhere else. I guess you have to be here from the beginning to the end of the season to understand and feel the full flavor of what I’ve tried to do justice to with words and pictures. Come and visit next year and really see what it’s like. I assure you, you will have a great time! In the meantime, Merry Christmas or Happy Holidays to you all from Manila! What are the Christmas traditions for your country?